(CNS): Police have arrested a local man following a robbery at a bank ATM Thursday lunchtime in downtown George Town. An RCIPS spokesperson said that the incident occurred at the machine outside Butterfield Bank in Fort Street at around noon. A 28-year-old woman had withdrawn cash from the ATM when she was approached by a man armed with a knife. He threatened the women and grabbed her hand, running off with the cash she had withdrawn. The suspect reportedly headed off towards Fidelity Bank through the car park at the rear. The woman sustained a small cut to her forearm when the suspect grabbed her but she did not require medical attention, police said. The police receive a description of the suspect as a Caribbean male with a light brown complexion, aged around 25-26 years, of slim build and with a clear hair line. He was wearing jean pants and a grey hooded top. As a result, a police investigation was launched and man was arrested around two hours later in the Shedden Road are on suspicion of robbery. Police said he remains in police custody while enquiries continue. Anyone who was in the area of the bank around noon today and witnessed the robbery is asked to contact George Town CID. Anyone who saw the suspect before the incident, or running off afterwards, is also asked to come forward. Information can be passed on 949-4222, the RCIPS tip-line 949-7777 or via Crime Stoppers 800-8477(TIPS). (CNS): A local attorney employed at Maples and Calder whose estranged wife was found dead hanging from a door in her condo in April 2012 is taking legal action against the coroner who presided over the inquest into her death, which resulted in an open verdict. Andreas Haug has applied for a judicial review to have the open verdict in the case of Lija Godenzi changed to one of suicide. He accuses the coroner of implying he had killed his 43-year-old wife and of putting undue pressure on the jury to return an open rather than a suicide verdict. Haug claims that the coroner in the case, Eileen Nervik, QC, misdirected the jury over the evidence they should or should not consider, that she misstated the standard of proof for suicide and prevented submissions after her summing up. The inquest into Godenzi’s death took place in November, and althoughthe police had concluded that Haug’s wife had likely taken her own life, at the inquest a number of issues were raised about the circumstances and called that assumption by the police into question. When the open verdict was returned, the police said that they would be reopening the case and they confirmed Thursday that the review into her death continues. The RCIPS would make no further statement, however, regarding the current status of that investigation or the legal action taken by Haug. In the document filed in Grand Court earlier this month Haug does not ask for a new inquest regarding the circumstances leading up to his wife’s death but asks the court to replace the current open verdict with a suicide verdict. In the background to the application, Haug’s attorneys say the autopsy report had suggested the death was consistent with suicide and at the time his wife was suffering from clinical depression. The lawyers also say that the police had investigated and were satisfied there were no suspicious circumstances. However, during the inquest the coroner and jury heard that the police had not taken prints from the home or conducted a full enquiry, and in her summing up Nervik had pointed to the shortcomings of the police investigation. Haug accuses the coroner of misunderstanding the burden of proof and not taking into account new authorities. The JR application also states that there was no evidence capable of supporting any reasonable doubt that his wife had killed herself. The lawyers claim that the coroner “erred by concluding the directions in such an unbalanced fashion that it placed improper pressure on the jury to return an open verdict”, and that what she told the jury conflicted with evidence. The application states that the coroner marshalled other facts in such a way that it amounted to advocacy rather than direction as she steered them towards an open verdict as opposed to the alternative of suicide. The Maples lawyer also states that the coroner improperly included and then excluded some evidence, such as a note found in her room saying, “Just do it”, and neglected to point the jury towards evidence that, he said, showed suicidal intent. After summing up, the legal document states that the coroner would not allow Haug’s lawyer to address her on the law. The lawyers also state that the coroner suggested that Haug could have killed Godenzi. He said that in her directions Nervik said the jury should be concerned about the possibility that Haug may have killed his wife. She had asked the members of the panel to think about who would gain from Godenzi’s death, as the couple were going through divorce proceedings and with her gone there would be no need of a divorce settlement. Although there was no life insurance, during the inquest Haug, who works in the hedge fund sector, has spoken of some $800,000 to be settled in the divorce. In his application Haug also states that there was no evidence to suggest that he killed his wife and the coroner erred when she implied he might have done so to the jury. At the inquest the jury heard from a number of witnesses that Godenzi and Haug were separated and were going through an acrimonious break. The jury also heard that Haug had a tracking device fitted to his wife’s car and was controlling her finances. In addition, he refused to answer questions from the coroner about whether or not he had spyware on his wife’s laptop, which went missing after her death. The court also heard that Godenzi had planned a trip to her native Australia the week of her death and that she had been thinking about future plans to return to her profession of optometry. See the full JR application below. (CNS) Updated: Following another stabbing in East End Wednesday night police confirmed that two men remain in hospital one with an arm injury, who has been arrested and a second with head and body wounds, Thursday. The two men were involved in analtercation at around 8pm, Wednesday 15 January, an RCIPS spokesperson said. The fight started between the men, who known each other in a house on John McLean Drive. "The altercation spilled out into the yard, where one of the men allegedly stabbed the other. Nearby residents intervened and the suspect ran off," the spokesperson added. Police and paramedics arrived on the scene a few minutes after the incident and the 24 year old injured man was taken to the Cayman Islands Hospital in George Town suffering from lacerations to his head and torso. The suspect, who is said to be 48 years old was then apprehended by the polcie and arrested by police less than forty minutes later. He was also found to have an arm injury and taken to the hospital for treatment but he was arrested on ssupicion of attempted murder. This is the second violent incident in the district in less than a week and East End residents have been voicing concerns about rising crime there and the lack of police cover. The MLA for the district, Arden McLean, has pleaded with the police commissioner and the government to do something about the lack of cover in the face of increased crime but his pleas have fallen on deaf ears. Anyone who was in the area at the time, and who has not already spoken to police, is asked to contact Bodden Town CID on 947-2220 or Crime Stopper 800-8477(TIPS). (CNS): Staff from the Department of Environmental Health and the Ministry of Health, Sports, Youth & Culture will be holding a special remembrance service for their missing colleague, Anna Evans, on Friday 24 January in George Town. It is three years since the civil servant who worked at the landfill disappeared without explanation. Despite an extensive search, including speciality dogs, and a continuing police investigation there has been no trace or sign of Evans since she was last seen by colleagues at the dump around lunch time on 24 January 2011. A reward was posted for any information on the 37-year-old missing mother of five children but no leads have given any indication of what may have happened her. 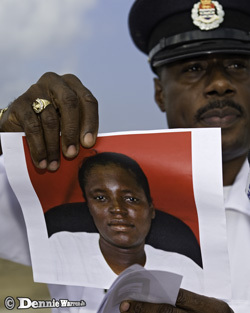 When last seen Evans, who was described as 5’7” with a dark complexion, slim build, brown eyes and black hair, was wearing her DEH uniform – grey pants, a grey and orange shirt, brown boots and a plain blue baseball cap. The Department of Environmental Health is asking the public for their cooperation and businesses that need to dispose of large amounts of waste are asked to do so early in the morning or after 1pm. However, the 24 hour drop-off area will remain open to facilitate disposal of small residential loads. The department apologises for any inconvenience this closure may cause. For further information, contact DEH at 949-6696. (CNS): The continued failure to agree on a modernised law to regulate the legal profession was once again on the agenda at the annual opening of the Grand Court on Wednesday, where the two bodies representing lawyers still appeared to be at odds. While the issue was not as prominent in the speeches as last year, as there seems to be some faith that the new administration may be able to tackle the ongoing issue, the Cayman Bar Association (CBA) and the Cayman Islands Law Society still have conflicting views over the proposed legislation. CBA President Dale Crowley said the continued failure to enact the legislation had resulted in more and more attorneys outside Cayman professing to practice Cayman Islands law, despite having no connections to the islands. The law, he said, had to offer protection for Caymanian attorneys.However, Alasdair Robertson, the president of the Law Society, said the law had to be about the regulation of the profession and nothing more. During his speech, the leader of the CBA, which represents 160 Caymanian attorneys and another 80 students and law graduates seeking a chance to enter the profession, said it was unfortunate that the profession had been unsuccessful again last year in the push for the implementation of a modernised Legal Practitioners Law in line with international standards. However, his colleague from the Law Society, which represents more than 500 attorneys practicing here, said that while they too were keen to see the law enacted and continued to work hard on finding a solution, the law had to be a simple modern piece of legislation which was about the regulation of the profession. Although Robertson said he agreed with all of what Crowley had said in his speech he pointed for the need for the law to focus on regulating the profession. He said while everyone hoped that the 600 or more attorneys in Cayman would behave properly, there had to be a system in place that made sure they did. He said it was the duty of lawyers not to look after their own but the entire profession. The proposed law continues to cause controversy as local attorneys and MLAs remain disposed to using the law to eliminate the discrimination that appears to still linger in the profession. Caymanian lawyers believe the law must include better protections and channels for advancement for locals, while the wider profession is seeking a way to regulate the overseas practitioners without necessarily tying their hands locally on recruitment practices. As I served for over 40 years in police services I believeI have the experience and background knowledge to offer my congratulations to Police Commissioner Baines for his actions following the alleged robbery on New Years Day. As a senior officer much time is spent on strategic planning with the luxury of having the time for discussion and team input. However, as a serving officer there are times when split second decisions have to be made in order to comply with the oath of office, made to Her Majesty the Queen, that includes a promise to preserve life and protect property. The incident on the 1st January certainly falls under having to make a split second decision. As this particular case is 'sub judice' I will not repeat the well reported details but here we have an unarmed and off duty police officer about to embark on a social day with family and friends. Suddenly confronted with a situation where allegedly armed criminals are bursting out of a store, and staff and customers have been subjected to a terrifying ordeal. He has to act. There is no time to call for assistance or to hold a briefing. Commissioner Baines has to resort to urgent and immediate action that will prevent harm to the public, both local and the thousands pouring off a cruise ship. It is highly unlikely that desperados of this nature will respond to a kindly "give it up son, you are under arrest" and if shots were to be fired how many innocents would be injured or killed. In my opinion he takes the only action appropriate for this very difficult situation and, whilst it is unfortunate that one person is injured, the prevention of further injury or harm to the public fully justifies his courageous actions. I am in full support of Commissioner Baines, who took charge of an ailing RCIPS after we had experienced five other commissioners in the previous two years. I am confident that any investigation into his actions on the 1st January will show that his actions were lawful and in the best traditions of the police service. When I commanded the Drug Task Force (DTF), my team and I were often subjected to criticism from the '9 o'clock army' that had spent a comfortable night in bed and had the benefit of hindsight and time; rather than the operational team that had to make instant decisions in the heat of critical operational engagements that were often highly dangerous. To help build the morale of my team I posted the following anonymous poem in our offices. It is from this poem that the most famous military regiment in the world takes its motto. 'It is not the critic who counts, not the one who points out how the strong man stumbled or the doer of deeds might have done them better. Please support your RCIPS. They do not always get it right but a team works better with support and constructive advice rather than being continually subjected to ill informed blogs and criticism. (CNS): A developer who is proposing to build a $360 million commercial, tourism and residential community covering 600 acres in East End has said it has financing in place to construct a 10-mile extension of the East-West Corridor from Hirst Road to Frank Sound Road and are in discussions with government over a public private partnership. However, the development not only poses a threat to the Botanic Park but plans to build the road along the current gazetted path will cut directly through the Mastic Reserve and surrounding areas. The news comes against the backdrop of a critical report from the UK about the lack of development controls in Cayman and before the National Conservation Law (NCL) has been implemented. The developers claim that they have planning permission for part of the development from several years ago but they told CNS they are planning to submit a modification application. Despite the magnitude of the proposed development, which includes a town and a golf course among other things, no planned area development (PAD) application has been submitted and no environmental impact assessment undertaken. The developers said that they have plans to do both, but nevertheless stated that construction would be starting in April. With no buffer between the proposed mixed use development and the Botanic Park, which is the first tourist attraction and environmental resource that is under threat from the project, the developer’s claim to be in talks with government about the road extension also poses a greater direct threat to the Mastic Trail. However this is not the case for the National Trust, which owns the Mastic Trail and surrounding reserve. The Trust is now exceptionally concerned about the threats and is urging government to re-route the gazetted road as soon as possible. The National Trust said that there were ways to avoid the “unnecessary destruction” as the road can be re-routed to allow the reserve to remain intact, as they called on government to work with them to keep the Mastic Reserve as the pristine and environmentally significant gem it is. At present, the road’s route, although gazetted, is not set in stone and the opportunity still exists to change the route. The Department of the Environment has gone on record in the past about the need to gazette a new route for the road before it is too late. Currently the proposed road corridor from Frank Sound to East End would also encroach on both the Salina Reserve as well as the Colliers Reserve in East End, and although the proposed development does not include the construction of this stretch of road, the National Trust said this would be the opportune time to address this issue as well. Check back to CNS later for more on the report from the Environmental Audit Committee in the UK which raises a catalogue of environmental risks in Cayman. See press release regarding the East End development below. (CNS): A man who was severely injured in an explosion at Caribbean Utilities Company in 2011 is suing his former employer for damages. Kurt Scott was the most critically injured ofthe two workers at the Grand Cayman power firm who were hurt when a generator at the plant exploded. Scott, who was just 26 at the time, was airlifted to the United States following the incident. Scott is now seeking “damages for personal injuries and consequential loss and damage caused by the negligence and/or breach of duty and/or breach of contract” by the firm, according to a writ filed in the Grand Court earlier this month. Scott is still in the United States, where he continues to receive treatment for his injuries almost three years after the incident. At the time of the explosion CUC said it had occurred during a start process at the plant site, when equipment associated with an MAK 9 MW generator was damaged and an investigation into how the explosion had begun. However, the results of that enquiry have never been made public. (CNS): A West Bay man told the court Wednesday that he was shot at over a cap last August, when he escaped with just a graze on his shoulder because he had ducked after the man accused of shooting him opened fire. Shane Bodden, who has been charged with threats to kill, wounding and possession of an imitation firearm with intent in connection with the allegation has denied being the alleged shooter and accused the complainant of making up the story to keep him away from his property. However, Joseph Ebanks was emphatic that Bodden was the man who threatened and shot at him when he found the defendant on his property. Ebanks insisted that Bodden had accused him of stealing his cap and demanded its return, otherwise he would shoot him, which, he claimed, is what happened. Relating the events of the evening of 27 August last year, Ebanks told the court that he had gone to visit his father. While he was there he had also checked on the family home next door, which was unoccupied at the time, but he was aware that people had been breaking the locks to get in. When he checked at around 8pm, he found Bodden there and the men had engaged in an argument before Bodden left. Ebanks then visited his father but at around 11:45pm he went back to the unoccupied house to check again and once again ran into Bodden outside the house. He said Bodden was threatening towards him and had demanded his cap, as he accused Ebanks of taking it, something Ebanks said he knew nothing about. Ebanks described Bodden’s demeanour as threatening and “very serious” and said he came towards him “eyes blazing” as he demanded the cap and threatened to shoot him. The witness stated that after Bodden made the threats he pulled out a black gun with a long muzzle and said, "I will shoot you; don’t think I won’t shoot you!" and then he fired the weapon. Ebanks said he ducked and turned and as a result the bullet grazed his shoulder. He said Bodden then took off behind the house and he went to call the police. Although officials could not confirm that Ebanks’ wound was the result of a gunshot and only one particle of gunshot residue was found on him, the expert witnesses could not rule outthat he was shot, the court heard. However, during cross examination Fiona Robertson, defence attorney for Bodden, accused Ebanks of making up the story of being shot as a way to get Bodden locked down because he was fed up of catching him on his property. She said accusing Bodden of shooting him was a way for Ebanks to achieve that end. If Ebanks was actually shot at all, the defence said, it was not by Bodden, who did not return to the property that night. Ebanks insisted that this was not the case, as he emphatically declared, “It was Shane Bodden that shot at me with a gun.” The witness said he would never have done anything to harm Bodden if he had not shot at him. Although Ebanks admitted to consuming a small amount of alcohol and some drugs earlier that day, he denied being “fuelled with alcohol and drugs” and making up the story, as suggested by the lawyer. He said he was not mistaken over who shot him and insisted that Bodden shot at him with his right hand. Although the defendant is left handed, Ebanks, who said he had known Bodden since he was around 12 years old, said he was ambidextrous and could use both hands. Issues over lighting at the time of the incident brought the case to adjournment, however, as the court heard that the crime scene pictures had been taken by the police during the day. As a result of the failure of the officers on the case to collect evidence relevant to the time of the crime, arrangements were made for an officer to return to the scene to take picture at night so the court could have a more accurate picture of the levels of lighting around the unoccupied property to judge the circumstances under which the witness was identifying the defendant. The case continues at 10am on Thursday morning and Bodden was remanded in custody. (CNS): The government is expecting to save more than half a million dollars a year if the first sixteen civil servants who have volunteered to leave the service accept their offers. Of all the applications reviewed by the Voluntary Separations Committee, 16 have been approved, according to the minutes of the deputy governor’s heads of department meeting on 16 December. The minutes reveal that only those applications with the “strongest underlying business case could be approved” from the undisclosed number of applications. However, government stands to cut the public sector wage bill by around CI$550,000 per year if the 16 who have now been informed about their applications agree to the terms. According to the minutes from the 2 December, which were released with those from the 16 December, chief officers have also been considering the existing civil service pay policy. This has been in place since 2008 and a review has begun to address some of the anomalies andconcerns which have arisen since its inception. It was agreed at the CS heads’ meeting that further consideration was required and the policy was set to be discussed at the chief officers' meeting on 16 December. However, according to those minutes, it was not brought up at the later meeting. In addition to the various issues relating to government’s succession planning and matters over staff reviews, the senior civil servants also discussed a staff motivation survey pilot that has been sent to 150 members of staff. The results of this survey, the minutes stated, would be sent to a third-party for analysis. Another award has also been proposed and approved by Deputy Governor Franz Manderson as part of his ongoing scheme to recognise the work of the civil service. The latest award is for communication and will go to one outstanding ministry or portfolio, focusing on a number of criteria, including media relations excellence, internal communications, change communications, crisis communications excellence, PR stunt of the year, external communications, publication, leaflet or flyer, campaign of the year, and communications of the year. He said the ward was intended to promote excellent communication across the civil service. It will commence in the 2014/15 financial year and launch at the end of the 2013/14 year. Manderson confirmed that people would be chosen from the private sector to serve as judges.